I have my first post up as a monthly contributor over at The Balanced Platter, the new site full of wonderful ideas for balanced, healthy living. 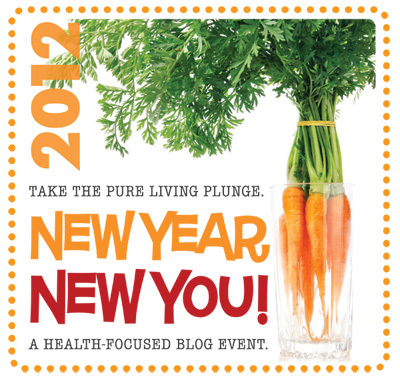 I am sharing 8 Steps Towards Lifelong Health and a “No-More-Diet Challenge”. Will you go on over and take the challenge? Well..wait. Don’t go until you first check out these 12 quick and healthy snack ideas below for the continuation of A New Year, A New You with my sweet friends over at Daily Bites and Lexie’s Kitchen. For this event, I am tackling some quick and healthy snack ideas to get you through your day (and satisfied until dinner). Do you have a witching hour in your house? You know. That time right around three thirty or four o’clock in the afternoon. The time when every one is hungry. Dinner is not ready yet and all (kids, spouses, you) are starting to get grumpy, and whiny…and really really annoying. My focus in this new year is to hit that crazy hour with a pre-emptive strike. My goal is to have some of these healthy ideas below ready and waiting when the kids walk through the door after school. Consider this Operation-Cease-and-Desist-of-the-Witching-Hour. Do you want to join in on this covert operation? Get out a muffin tin. No. I am not making you bake right now. Use that muffin tin to fill the openings with a variety of the snack ideas below. Put a couple of different dips in the center (in this photo, the dips on the left, from top to bottom, are homemade roasted pepper hummus, sunflower seed butter, and Sweet Potato Pumpkin Pie Dip – recipe below). 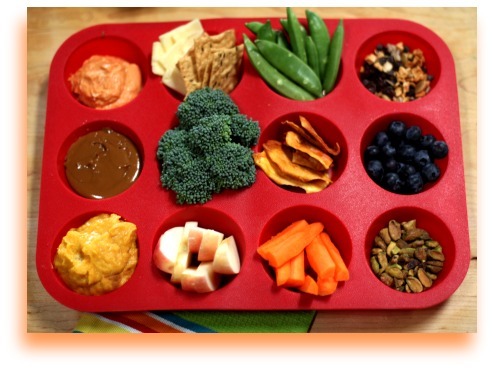 Then surround the dips with fresh and dried fruits, raw veggies, and some nuts and trail mixes and any other ideas from the list below or from your creative and ingenious minds. These simple ideas below will refuel all of that energy spent throughout the day (but all of these are also wonderful mid-morning snacks that can be packed up in lunch boxes as well). The other benefit is that if you add raw veggies and the kids are snacking on them, you do not have to worry so much if they are eating all of their vegetables at dinner time. And I have found that when my kids are starving they will eat those raw veggies sitting out. 1. 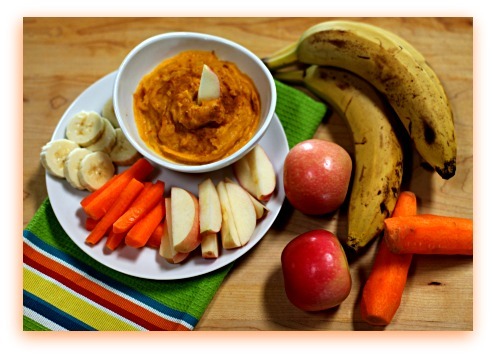 Sliced Bananas, Apples, Pears, or Celery with nut butter or nut-free sunflower seed butter for dipping. 3. Kale Chips – there are many store bought ones, but making your own is way too easy: tear kale away from stems and then tear leaves into bite sized pieces, place on baking sheet, drizzle with 2 Tbsp olive oil and sea salt (and any other other seasoning of choice), bake at 400 degrees for 10-12 minutes, stirring once halfway through. Enjoy. 4. Sweet Potato Pumpkin Pie Dip (Recipe Below) to dip fruit and veggies in (or even to eat with a spoon). 6. Trail mix with Dairy Free Dark Chocolate pieces for a treat (Enjoy Life Foods has great Nut-Free Trail mixes) or make your own with: chopped raw nuts such as almonds, pecans, cashews, pistachios, or macadamias (if not Nut-Free), raisins, dates, apricots, cranberries, sunflower seeds, pumpkin seeds, shredded coconut, dark chocolate pieces, etc. 7. Dehydrated Fruit (sulfite free). 8. Gluten-Free and Allergy Friendly Granola Bars cut into small pieces. 9. Home-made air-popped popcorn tossed with organic coconut oil and celtic sea-salt. 10. A small serving of dry Gluten-Free Granola, store-bought or home-made. 11. Gluten-Free, Dairy-Free “Bran” Muffins cut into pieces. 12. Raw, organic cheese slices (if not dairy-free) with grain-free or gluten-free crackers. 1. Whisk together, or puree with immersion blender, all ingredients until smooth. Serve with apples, bananas, pears, carrots, celery, cucumbers, etc. 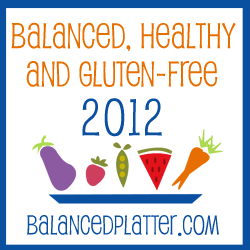 Okay, after you tell me what your favorite snack ideas are, go on over and take my challenge at The Balanced Platter! We do a lot of apples and nut butters here. I love making my own potato chips too in the microwave makes it so much easier! Carrots and hummus are a hit here too. Max and I love kale chips, but the other two won’t go near them. Socca dipped in pizza sauce is fun too! Love your display. Too cute! Thanks Hallie! And I totally appreciate you including me in your awesome event! I love all of the ideas everyone is coming up with! That is one cute muffin pan and full of goodies that I would love to eat right now. And that dip is so creative. I know just who to serve it to. Thanks, dearie. what a great idea and so fun. I love fun and getting the goods into the family. I’m off to grab my muffin tin! Diane, that is a good motto…”Getting the goods into the family..” LOL Thanks, my friend! Gotta love that witching hour, Lex! It hits me too, which makes it even worse. Because then I am grumpy while they are pestering me for food. This way, hopefully, everyone can be happier and I can make dinner in peace. Yum – this recipe looks so good. Gotta try it – always looking for something other then a nut butter to dip my veggies and fruits in. Brilliant idea–I am going to do this for myself!! (well, maybe not all 12. . . )!! 😉 So many great ideas–and I love the sound of that dip! You popular lady you! Love, love, love the muffin tin snackers. Too cute AND practical! What a cool idea! I’d like to have all my meals like this actually, perfect for portion control 🙂 and lots of fun, why should the kids get it all? Yum, yum, that dip sounds awfully good, and love your idea of putting all these little snacks in muffin tins! And I agree, we could all benefit from this type of assortment of snacks. Perfect portions and can create a great variety! I’m going to try this dip. I love sweet potatoes and am always looking for new snack ideas. My favorite snack is an apple with nuts or nut butter. Thanks. Question: You say 1/2 of a sweet potato but how big is it? I eat a lot of them and some are quite small and some are huge. Can you give an approximate measure of it? Maybe a cup? I’m planning to take this to a dip party Friday. I think apple slices would be a good dipper. Any other ideas? HI Shannon. Great question. I will go and change the recipe. I used about 1 cup of my sweet potato. It was a large one, though. Also, we have dipped apples, pears, bananas, and even carrots, celery, and sugar snap peas in this. Have a fun party! I made this Friday and it’s yummy. (Left out the pumpkin because I’m not a huge fan) I dipped a slice of apple into it and the combination was so good that I didn’t prepare any other dippers. And I took it to the party where it was enjoyed. Thanks! Muffin tin to display all the goodies, what a clever idea. Sure wish I thought of that when my kids were growing up.